A bit of behind the scenes information about my PAD for September 16th 2009. 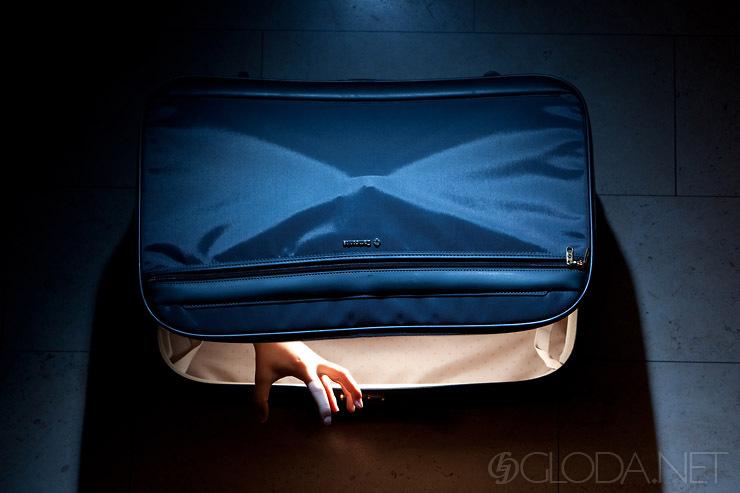 The initial concept for the picture was to have a hand come out of a suitcase, and to add some visual drama by putting a lightsource inside the suitcase too. I placed one of my flashes inside the suitcase. Because I wanted the light to spread as evenly as possible, I placed the flash inside a clear plastic tube (the ones you get when you buy 100 DVD-Rs together… I burn every RAW file I might ever need to get back to on DVD. Twice.) Since the lid would be closed, Canon’s ETTL triggerism functionality wouldn’t work here – it needs line of sight. A perfect opportunity for my new PocketWizard set then. The flash and the FlexTT5 fitted inside the tube easily. A stofen omnibounce-type diffuser spread the light out a bit more. The settings on this flash were 32mm at 1/2 power. 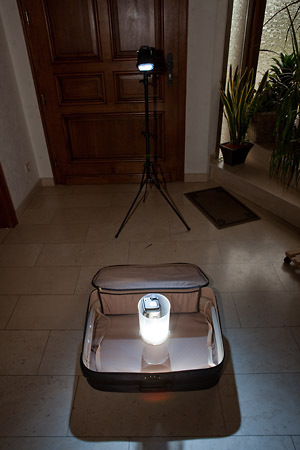 The flash on the Manfrotto Nano 005B lightstand, which provides the light outside the suitcase is still triggered via Canon’s ETTL. It’s zoomed in to 100mm, at 1/2 +0,7 power. A full CTB (Color Temperature Blue) gives the light a blue cast that contrasts with the neutral light from the suitcase. To limit the area lit by this flash to a small surface, I added a DIY straw snoot to it. That way the beam behaves more like a spotlight. I took one picture with just the suitcase, and another with the same settings (Canon 5DMkII, ISO100, f/9, 1/200) where my sister put her arm in from one side and out at the front again. In Photoshop I layered the two photos over each other. Now all I had to do was mask Carmen out of the photo so that only her hand would remain visible.